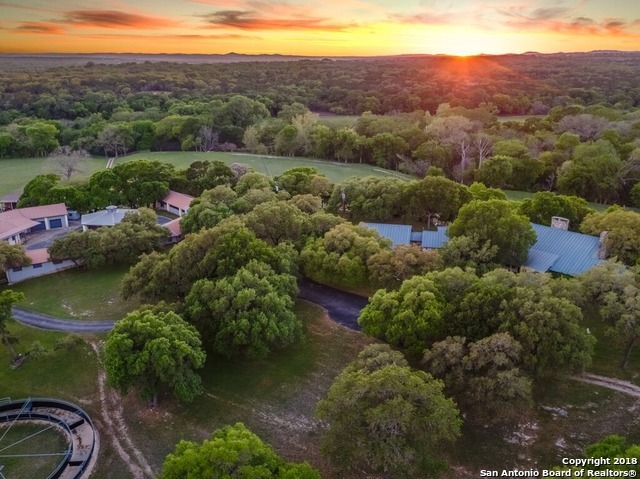 All NOT IN DEFINED SUBDIVISIO homes currently listed for sale in Bulverde as of 04/18/2019 are shown below. You can change the search criteria at any time by pressing the 'Change Search' button below. "Introducing 3801 Ocean Dr, arguably one of the most iconic homes on the Corpus Christi Bay. This updated Greek Revival features all of the modern amenities perfectly balanced w original features. Spacious foyer w grand staircase, elegant formal room w dental crown molding & marble mantel, separate dining room thru French doors, dream gourmet kitchen w oversized granite center island. The master wing features a marble bath, room-sized closet & private living area. Additional 3beds up w game/5th "
"4WR Ranch. New custom home. Gorgeous views. Walls of glass. 15.82 acres. Chef kitchen open to vaulted great room. Viking appliances. Granite counters. Pantry. Dumbwaiter. Master on main floor. Split plan. All ensuite bedrooms. Third floor cupola. In wall vacuum. 1,140 SF deck. 1,600 SF patio. 3 car garage. RV garage. HVAC Harley garage. Pond. 100-foot elevation range. Gated entry. Low crime, high home values, income, net worth. Available with RV Park or after RV Park sells." "Circa 1893 Carl Durst Home and the Promised Land Ranch. 3,095 SF, 4 bedroom 2 bath home with expansive master wing. 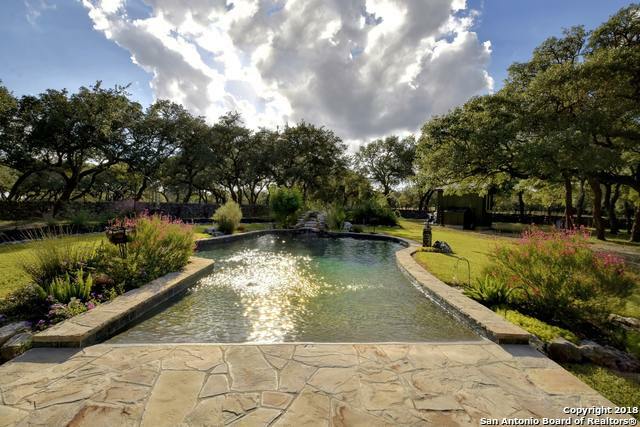 Compound features pool, tennis court, party barn, 1,665 SF patio, 1,417 SF open porches, 640 SF deck, 1,020 SF enclosed storage. 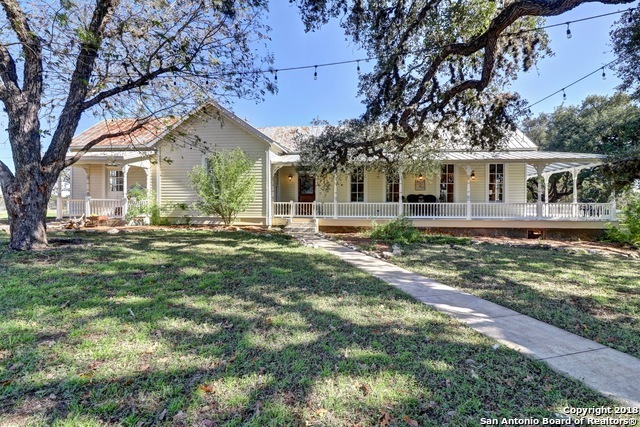 21.3 beautiful acres covered with Century Oaks and Native Pecans. Has been successful BNB. Superior demographics vs. Fredericksburg: 2.5 times annual projected home value increase; higher home values and net worth; lower crime. 9.2 MI to Fredericksburg." "New Survey 3/19. 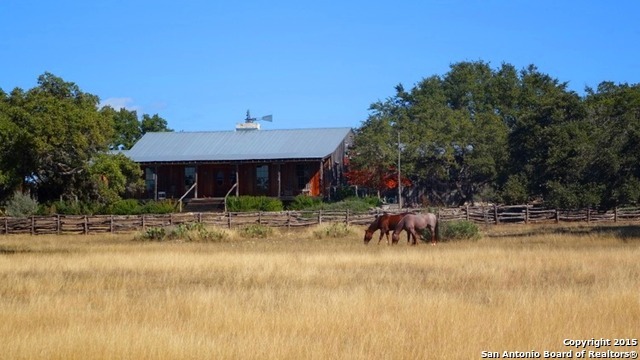 Unrestricted, wildlife-exempt 38.8+/- serene acres with a 3,327 sq. ft. 2-story immaculate home (KCAD). Enjoy the variety of wildlife and a view of the pond on your wide back covered porch. The home is ideal for entertaining. Old World doors and lots of river rock adorn the home. Gather around the large, functional kitchen...the Heart of the home. Peacefulness abounds allowing for hiking on trails to cliffs, streams and waterfalls. Possible Owner finance w/a/c!!! In award-winnin"
"+/- 25 pristine acres with 2 homes brimming with trophy oak trees featuring a historic rock wall. 2,322 sf Carriage House boasts a 2 bay garage, office, & luxurious upper master suite in a tree house like setting overlooking a sparkling pool and cedar gazebo. 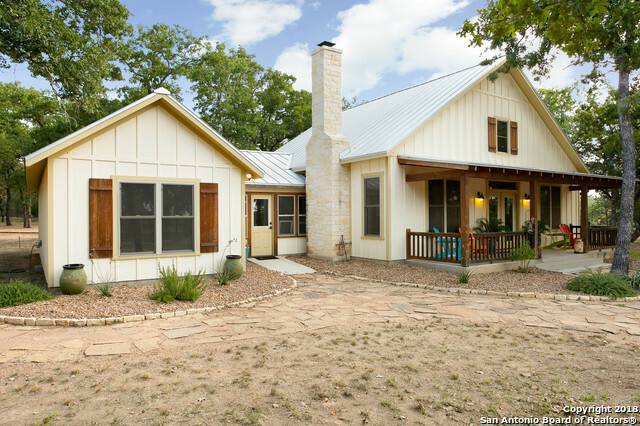 2 bed, 1 bath cottage showcases artistic touches, rocked fireplace, and screened-in porch. 720 sf workshop is ideal for all projects of all sizes. Minutes to local amenities. B&B's and hunting allowed. Wildlife Exempt. 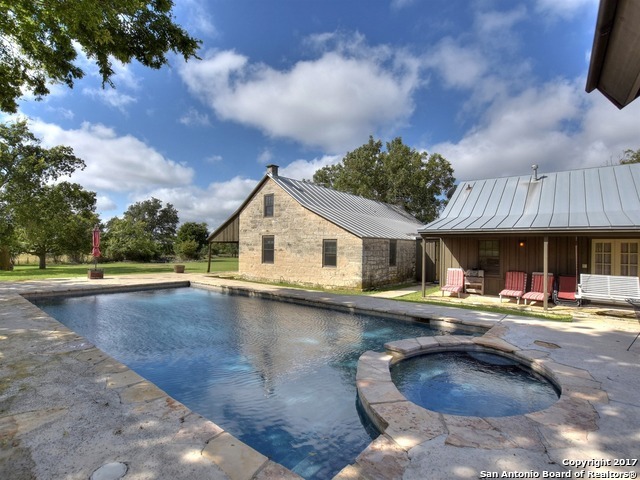 Additional acreage av"
"Here is the perfect chance to own an authentic Texas farmhouse with a detached guest house on 22+/- acres close to Boerne. 2600 sq. ft. home of cypress board/batten * wide plank floors* vaulted cypress ceiling* 12 ' stone FP* gas cooktop*Subzero refrig*2 masters flank each end of home* 3rd BD & BTH in guest house*separate study* library/TV room* climate controlled wine room*large garden; terraced & drip irrigation*4-6 stall barn w/ apartment. Seller is open to dividing property. 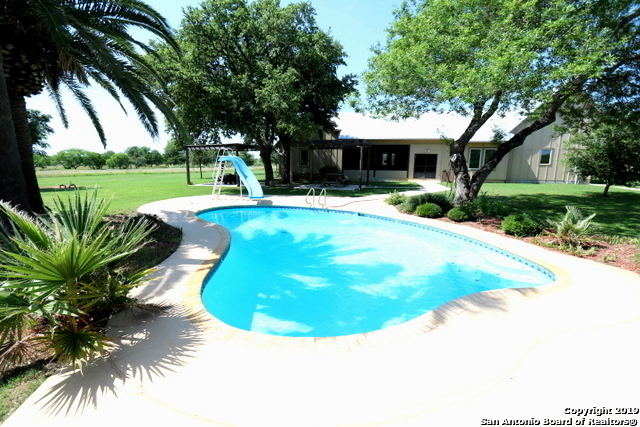 UNRESTRICTED/A"
"57 Acres w/Low Ag Exempt taxes,2-Lg Ponds fed by Water Well,Land is Fully Fenced w/Coastal field,Auto Gated entry,30x16 Ingrd Pool w/slide & Xtra Lg Patio deck,3-Gazebo's,20+ Zone Sprinkler Sys,Water Well w/Storage tank & Rural Water meter,30x24 Finished out Workshop,40' Connex,Winding asphalt roads on property,Nearly 2700sf Very Custom Hm w/Metal Roof & Lots of Upgrades,28x28 Gar w/10' Tall doors,Upgraded windows,2-Tankless Water heaters,Propane tank,28x18 Screened in Patio,40x10 Porch,8' doors"
"GREAT OPPORTUNITY to own a Bed & Breakfast that is less than 3 miles from downtown Fredericksburg: private, gated & fenced setting, 3 separate areas to rent w/ an outdoor open living area including a fireplace, bar, built in BBQ pit & sink. This lovely dog trot style home is ready for your buyers w/ an additional space to finish out for another rental area. Can also be used as a personal residence w/ some great guest areas. There is a 3 car oversized carport w/ room for a boat or RV. ADT securit"
"OWNER FINANCE*75 AC*2 Stock Tanks*Huge Lake-like Pond*57FT X50 FT 2 STRY HIGH Hanger w Full Bath,Hydraulic Lift for Cars,22 FT X 50 FT Loft*Det 2 BR Apt w Huge LR,Huge Kit*Long Range Vws from most Rms* Vaulted Cedar ceilings+cedar walls thruout*Satillo Tile,Hardwd,Ceramic Tile*NO Carpet*Mast has Sep 17Ft X12Ft Sitting Rm,8 ft Wide Flr to Ceiling Stone FP w Hearth,Large Mantle,12 FT Long Walk-in Closet, Cathedral Ceiling, CEDAR walls,CEDAR Ceiling, Access to Private Patio*4 car CP+Concrete Multi-"
"Some might call this an ESTATE I call it a MANSION that will top everything you have ever seen in this price range. If you are looking for the BEVERLY HILLS LUXURY living experience w/ all the bells & whistles, look no further, this MANSION has it all. A STATE OF THE ART LUXURY kitchen. 42x45 Shop w/ 28x45 attached & 36x36 detached carport WOW !! THERE is a 860 sqft apartment, outdoor kitchen, fire pits, CHIPPING GREEN + STOCK TANK & the list goes on & on. 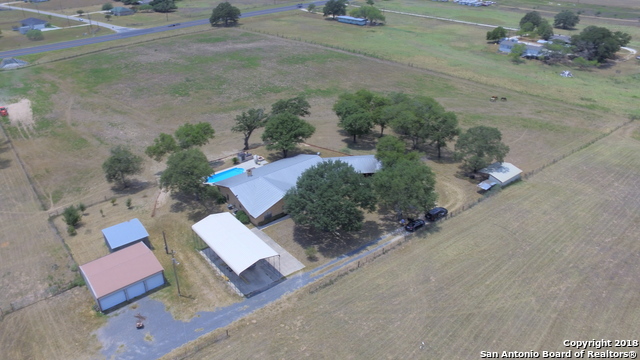 Guadalupe River boat ramp 5 min from ho"
"Nearly 3400sf Brk Hm w/Metal Roof & LOTS of EXTRAS' on 17.9 Fenced Acres,Ingrd Pool w/BBQ pit/smoker,Fire pit & Approx 60x30 Patio Area,3-Stall barn,Chicken Coop,60x30 Open Faced Metal Bldg,50x24 RV Cover w/connections,34x24 Det Gar/Workshop w/3-Doors,24x20 Shop,30x24 & 20x20 Carport,48x16 Bldg that was going to be 2nd living area,HOME has 3-Lg Bd's,2-Ba,2-Living & 2-Dining areas,Updated Island Kit,3-A/C Units w/upgraded filter sys,Radiant barrier,2-Water heaters,No Carpet flooring,2nd Address i"
"COUNTRY RUSTIC IN THE CITY. HIDEAWAY ON 1.88 ACRES. LARGE COVERED FRONT PORCH . LIVING AREA HAS MASSIVE ROCK FIREPLACE AND CATHEDRAL CEILINGS. WOOD SHUTTERS ADD CHARM. INCREDIBLE AMOUNT OF STORAGE IN THE HOUSE. LOTS & LOTS OF MATURE TREES SURROUND THE HOUSE. GREAT LOCATION." "COMMERCIAL OR RESIDENTIAL .THIS RANCH STYLE HOME IS LOCATED ON A BEAUTIFULLY LANDSCAPED 1.39 AC Yard with mature trees . 2030 sq.ft. HOME WITH 3 BEDROOMS,2 BATHS, LARGE LIVING AREA WITH OPEN FLOOR PLAN. RECENTLY UPDATED WITH NEW APPLIANCES, WOOD TILE FLOORING,GRANITE COUNTER TOPS,FRESH PAINT AND MASTER BATH AND CLOSET SYSTEM LIKE NO OTHER. CONCRETE CIRCULAR DRIVE. ALSO INCLUDES 800 SQFT COMMERCIAL BUILDING WITH ASPHALT PARKING LOT. INCLUDES 1200 SQFT METAL BLDG WITH CARPORT ON FRONT AND BACK. 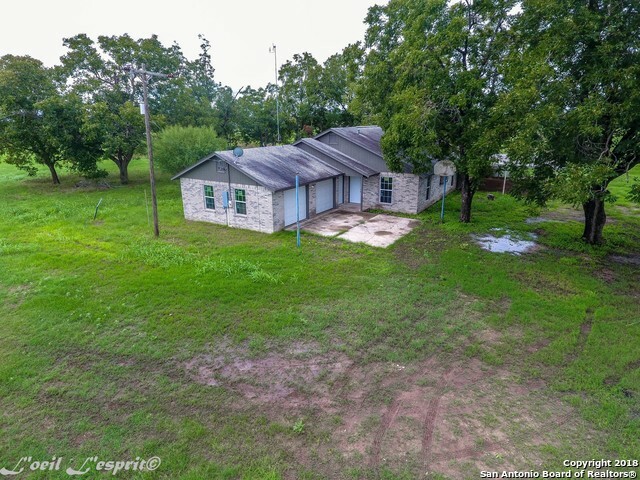 CH"
"Estate Sale,2-Very Clean All Brk Homes on 12.39 Acres w/Hilltop Views,Circular Concrete & Asphalt driveways Thru-Out,Rural Water & Water Well w/storage tank & 2-Meter loops,400sf Shop,Main HM is Approx 2200sf 4-Side Brk,3-Bd-3-Ba,Newer paint & flooring,25x24 Gar w/Radiant barrier,Sprinkler Sys,Jacuzzi sit in tub,Real fireplace,2 Water heaters,38x12 L- Shaped patio,2nd HM is Approx 1000sf 4-Side Brk w/Det 440sf Brk Gar,2-Bd,1-Ba,Utility Rm,Live in Main Hm & Rent the Other as they are not that clo"
"HARD TO FIND PRIME HILL COUNTRY RIVER PROPERTY. RESIDENTIAL INCOME OR COMMERCIAL DEVELOPMENT. FIRST TIME ON MARKET IN 20 YEARS. 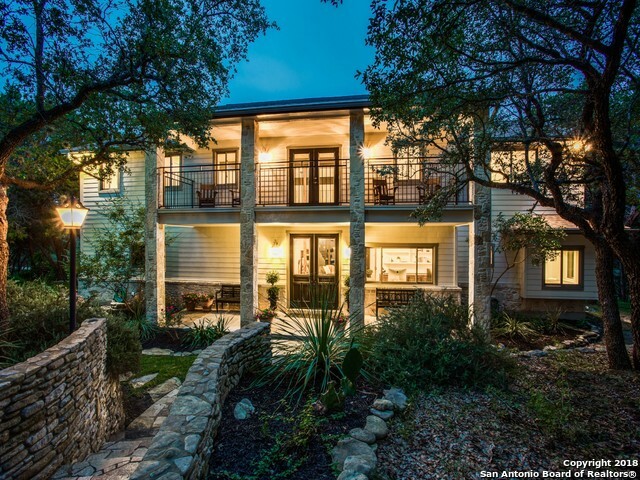 THIS IS AN OPPORTUNITY TO OWN A PIECE OF THE HILL COUNTRY IN A WONDERFUL SMALL TOWN. THESE RIVER PROPERTIES RARELY TURN OVER. 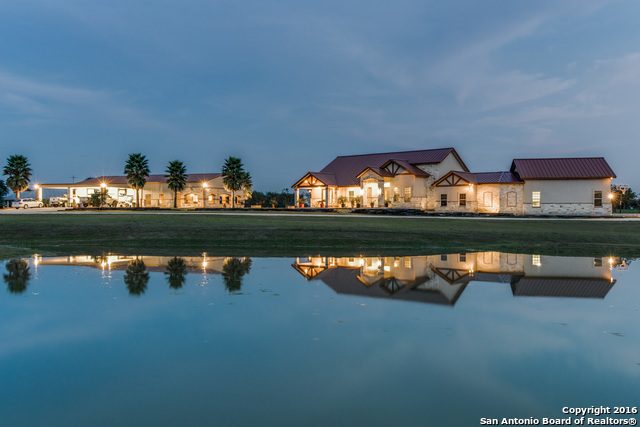 LOCATED ON THE TEXAS HILL COUNTRY TRAIL ON THE CLEAR FLOWING WATERS OF THE SABINAL RIVER AND A SMALL LAKE GREAT FOR KAYAKING AND FISHING. WITHIN 14 MILES OF GARNER AND LOST MAPLES STATE PARKS. 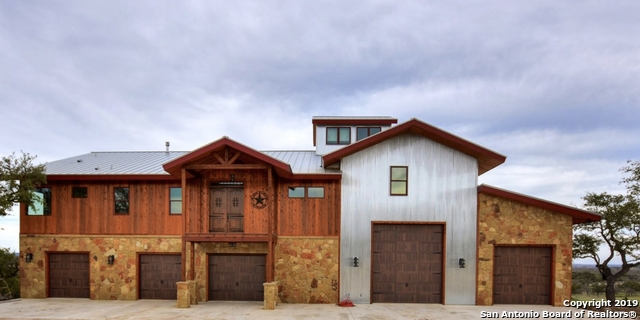 ABUNDANT WILDLIFE ON PROPERTY INCLUDING AXIS"
"BEAUTIFUL ROCK WATERFRONT HOME W/234FT DEEP WATER ON 0.93 ACRES.OPEN FLOORPAN WITH AMAZING LAKE VIEWS.LOVELY CHERRY WOOD FLOORS(NO CARPET),LOTS OF WINDOWS,ROCK FIREPLACE. LIBRARY/STUDY. INTERESTING GARDEN W/RAISED BEDS SHAPED LIKE SUN/STAR/MOON. CONCRETE COVERED PATIOS. ROOF TOP PATIO.AVIARY,STORAGE S.FENCED & GATED,END OF THE ROAD PRIVACY. 2 STAIRCASES TO LAKE-1 on MAIN BODY & 1 in COVE.YOU WILL LOVE THIS HOME." 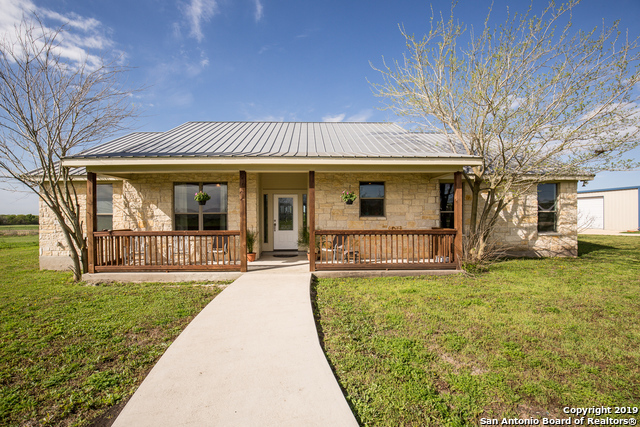 "This is a one of a kind custom built home with 3 large bedrooms, 2 full baths, 2 half baths, stained concrete floors and open floor plan. Wood burning stove. Upstairs is one full media room with half bath and attic storage. Covered wrap around porch. 18 acres fenced/cross fenced. 350' well for exterior use. Many fruit trees. About 1.5 acre fenced around home. Remaining property is fully wooded full of wild life. Cancel your deer lease and hunt from your back yard and enjoy fishing in the stocked"
"Virtual tour shows 44 photos, can also view @ youtube.com 1629 Pyron Ave Walk to World Historic site Mission San Jose!! One of a kind custom built using left over bricks from the Hemisfair Arena! Metal Roof! W the exception of a loft & kids secret hidden play rm it is a one story. Vaulted ceilings! Many brick interior walls! Cool rustic feel throughout. In ground pool & spa! 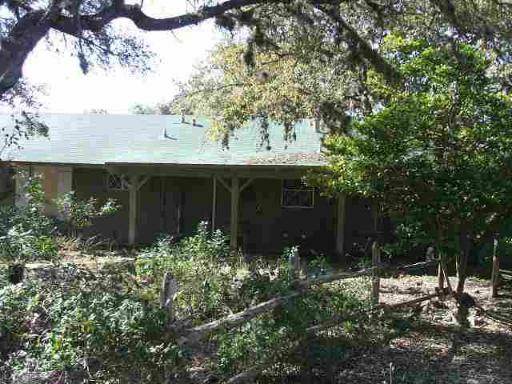 Level just shy of an acre loaded w mature tress, fire pit &backs to the Old San Antonio River. 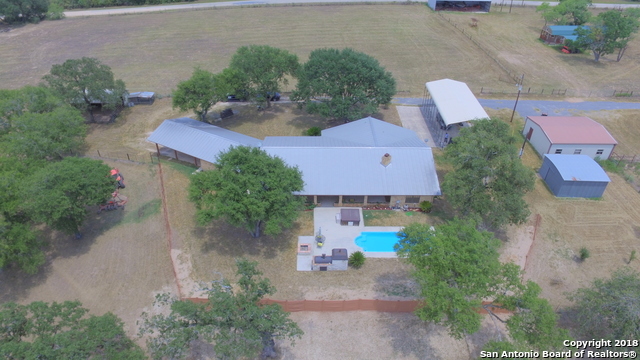 3 wall carport w upstairs "
"Nearly 3400sf Ranch Style 4-Side Brick Hm w/LOTS of EXTRAS' on 12.71 ACRES that is fully fenced,Metal Roof,32x12 Ingrd fiberglass Pool w/Lg BBQ pit/smoker,Fire pit & Approx 60x30 Patio Area,3-stall Barn,12x8 Chicken Coop,50x24 RV Cover or Carport w/Connections,34x24 Det Gar/Workshop w/3-Doors,24x20 Shop,30x24 & 20x20 Carport,Pipe fenced gated entry,HM has 3-Lg Bd's,2-Ba,2-Living & 2-Dining areas,Updated Island Kit,3-A/C Units w/Upgraded filter sys,Radiant barrier decking,2-Water heaters,No Carpe"
"Live Water! Marion ISD! 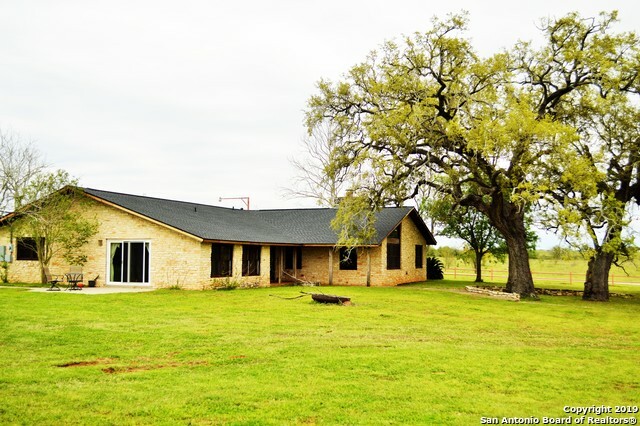 This beautiful 3/2 house w/office on 11.5 ac just S of Marion,TX in Guadalupe Cty. This spectacular property has it all, a 30x50 barn/shop w/bathroom, pond, field, & yr round creek! The entire property is fenced & the house has a separately fenced back yard for pets! Imagine sitting on the back porch with a view of the pond, field, & creek while enjoying the sunset! Abundant wildlife including deer, hogs, & turkey. Hunting allowed & no deed restrictions. 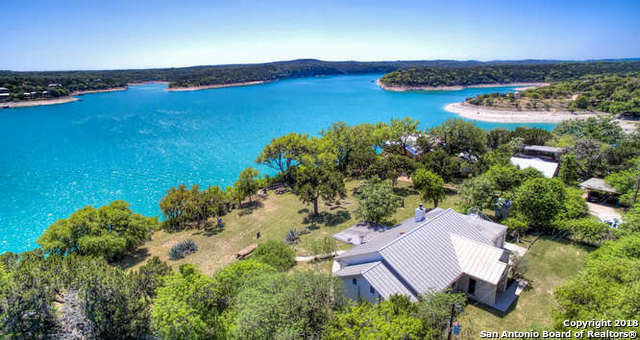 Close to HEB & r"
"VIEWS VIEWS VIEWS.LOVELY WATERFRONT HOME ON THE DEEP WATERS OF MASTERSON'S POINT. ROOM TO GROW ON 2.96 ACRES. 3 BED 2 BATH HOME PLUS A 400SQFT GUEST HOUSE. DOWNSTAIRS MASTER BEDROOM W/FULL BATH,UPSTAIRS LOFT GIVING 2 BEDS & FULL BATH. EXPANSIVE LAKE VIEWS FROM YOUR DECK. CEMENT STAIRS TO A LOVELY CEMENT BULK HEAD. 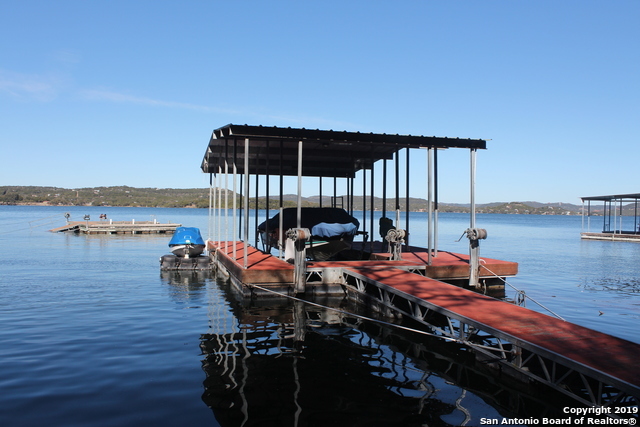 COVERED FLOATING DOCK W/BOAT LIFT. LOVELY GAZEBO TO ENJOY THOSE LAKE BREEZES.NATIVE LANDSCAPE & ASPHALT DRIVE.GATED ENTRY. WOW!"